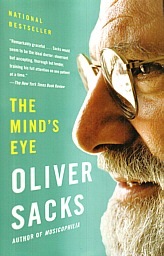 In this book, Sacks presents a series of essays about interactions between our minds and our eyes. How do we see? How do we read? How do we see things in 3-D? He gives us examples and explanations of what happens when either or both the mind and the eyes operate abnormally and when the connection between the mind and eye gets somehow disturbed. The first patient he introduces us to is Lilian, who can read individual letters in an eye chart, but can no longer read words or music. Tests showed some low activity in her visual cortex, possibly a degenerative condition, as her problems began slowly. Sacks did a novel thing for a neurologist, he visited her in her home to see how she coped at home. Her kitchen had everything sorted color, size, shape, position, context, and association and thus she rarely made any errors in cooking. She served tea and biscotti to Sacks and her husband, and when Sacks got up to leave, she suggested he take the remainder of the biscotti with him, but because the plate had been moved, she could not find the clearly visible biscotti on the table. Before leaving Sacks knew she played the piano and asked if she'd play a piece for him, which she did, first a Bach fugue, then two Chopin mazurkas. She played using "muscle memory" and her finely tuned ear. (Page 14, 15) Sacks compared Lilian's agnosia to that of Mr. P, of The Man Who Mistook His Wife for a Hat fame. When she visited Sacks' apartment, she recognized his grandfather clock, while Mr. P had tried to shake hands with a grandfather clock. (Page 23) Her musical skills remained even though she had to play with a score. She took a Hayden quartet and arranged it for piano. On a later visit, Sacks asked if she'd play it again for him. [page 31] At the piano, she first blundered, hitting wrong notes, and seemed anxious and confused. "Where am I?" she cried, and my heart sank. But then she found her place and began to play beautifully, the sound soaring up, melting, twisting into itself. Claude was amazed and moved by this. "She hasn't played at all for two or three weeks," he whispered to me. As she played, Lilian stared upward, singing the melody softly to herself. She played with consummate artistry, with all the power and feeling she had shown before, as Haydn's music swelled into a furious turbulence, a musical altercation. Then, as the quartet drew to its final, resolving chords, she said, simply, "All is forgiven." The next case Sacks shares it is that of Howard a writer of novels, who suddenly one day found that he could write, but could no longer read. All the words on his newspaper looked as if they were written in the Cyrillic alphabet and were meaningless to him. But when admitted to the hospital and the nurse suggested that he write his name, he wrote it perfectly and added on several sentences which were also legible. After he had written these sentences, he was unable to read them. He could talk, walk, write, but was unable to read. He had alexia sine agraphia, no reading ability, but he could still write. Howard persevered with attempting to read until one day he discovered that if he traced the letters of a word he saw on a page using his tongue on the back of his teeth, he could understand the word. Using this laborious method he became very proficient at, he could once again read. Then one day, he bit the end of his tongue by accident and with his tongue swollen, he could not use it to read. Biting his tongue had made him temporarily illiterate. With his new found ability to read, he began writing again on his computer, and had to depend on his editor to read the entire book to him, so he could reorganize it as necessary in his mind. [page 80, 81] His new novel (which he called Memory Book) was published in 2005, and this was followed in fairly rapid succession by another Benny Cooperman novel and, in 2007, a memoir, The Man Who Forgot How to Read. Howard Engel is still alexic, but he has found a way to remain a man of letters. That he was able to do so is a testament to many things: the dedication and skill of his therapists in rehab, his own determination to read again, and the adaptability of the human brain. "The problems never went away," Howard writes, "but I became cleverer at solving them." The next problem Sacks describes is that of being "face blind". It was a problem that beset him all his lifetime, so he becomes his own patient in this essay. Early in his school years, he could only recognize two of his closest friends, Eric by his thick glasses, and Jonathan by his tall and lanky physique. Ten years later, his friends could recognize hundreds of their schoolmates from the yearbooks, but he couldn't recognize any. I would be instantly and hopelessly lost. I wanted to be adventurous, to go to exotic places — but I could do this only if I bicycled with a friend. At the age of seventy-six, despite a lifetime of trying to compensate, I have no less trouble with faces and places. I am thrown particularly when I see people out of context, even if I have just seen them five minutes before. Sacks tells stories about his problem as glibly and accurately as if he were relating what a patient had told him. [page 85] My problem with recognizing faces extends not only to my nearest and dearest, but also to myself. Thus on several occasions I have apologized for almost bumping into a large bearded man, only to realize that the large bearded man was myself in a mirror. The opposite situation once occurred at a restaurant with tables outside. Sitting at one of these sidewalk tables, I turned to the restaurant window and began grooming my beard, as I often do. I then realized that what I had taken to be my reflection was not grooming himself but looking at me oddly. There was in fact a gray-bearded man on the other side of the window, who must have been wondering why I was preening myself in front of him. In his study of prosopagnosia, Sacks found that, while people with this syndrome have face-blindness, they often have problems recognizing other objects, mistaking an apple for a pear, or even in some cases being unable to recognize a particular handwriting style. Sacks had congenital prosopagnosia, but there are cases of acquired versions of the syndrome. 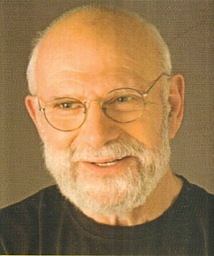 In his essay on "Stereo Sue" , Sacks reveals his love for stereo images, which he's had since childhood. I remember seeing old black and white photos appearing in 3-D in an old stereoscope. The ViewMaster 3-D gadget came out when I was a teenager and the colorful 3-D images that came from the cardboard disks with tiny slides were spectacular. Also 3-D comic books came out during my early teens, and I was curious as to how they worked. I began to draw 3-D images, one image in red and an almost identical one in green and view them through the 3-D glasses. The result was a monochromatic 3-D image, which excited me as I discovered how they worked. Sue had crossed-eyes and had surgery on her eyes to correct the condition, but lacked binocular or stereo vision, and no one had ever told her that was so. Taking a course in neurophysiology as a junior in college, she discovered she lacked binocular vision. She took every stereo test she could locate and she failed all of them. She went to an eye doctor who discovered her eyes were misaligned and prescribed a prism to shift one eye to align with the other vertically. Suddenly 3-D objects began to pop out of the flat space in her visual field. She was slowly creating her binocular vision and soon began seeing the whole world in 3-D. She was enthralled by her new way of seeing the world. [page 142, 143] One winter day, I was racing from the classroom to the deli for a quick lunch. After taking only a few steps from the classroom building, I stopped short. The snow was falling lazily around me in large, wet flakes. I could see the space between each flake, and all the flakes together produced a beautiful three-dimensional dance. In the past, the snow would have appeared to fall in a flat sheet in one plane slightly in front of me. I would have felt like I was looking in on the snowfall. But now, I felt myself within the snowfall, among the snowflakes. Lunch forgotten, I watched the snow fall for several minutes, and, as I watched, I was overcome with a deep sense of joy. A snowfall can be quite beautiful — especially when you see it for the first time." In his essay "Persistence of Vision" Sacks becomes a patient again, this time with serious eye problems in the form of a tumor in his eye which costs him his own binocular vision and then his own life. From this chapter he segues into the eponymous essay, "The Mind's Eye". 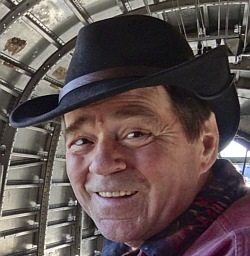 He discusses John Hull's book, Touching the Rock: An Experience of Blindness, in which he describes how he progressively lost all of his life, entering a state he called, "deep blindness". Rain has a way of bringing out the contours of everything it throws a colored blanket over previously invisible things; instead of an intermittent and thus fragmented world, the steadily falling rain creates continuity of acoustic experience . . . presents the fullness of an entire situation all at once . . . gives a sense of perspective and of the actual relationships of one part of the world to another. With his wonderful prose and in-depth research as well as personal experience with his own problems and those of others, Sacks allow each of us to become a full-body seer of what it means to be a human being. He takes us inside people who can no longer read, people who can write but cannot read, people who cannot recognize familiar faces, people who acquire stereoscopic vision at age fifty, people who lose their full sight and discover how to experience the world with all their remaining senses. Sacks has gone now, but like a true friend, he has left tracks on our heart.